Ghungroo school of dance teaches both adults and kids. However, there is an essential difference between approach taken for adults and kids. While for adults, learning is mostly self-initiated, for kids it is a mixture of parental eagerness and curiosity to learn. Therefore it is important to nurture this curiosity and ensure that kids find class time fun and interesting and look forward to each session with eagerness and joy. 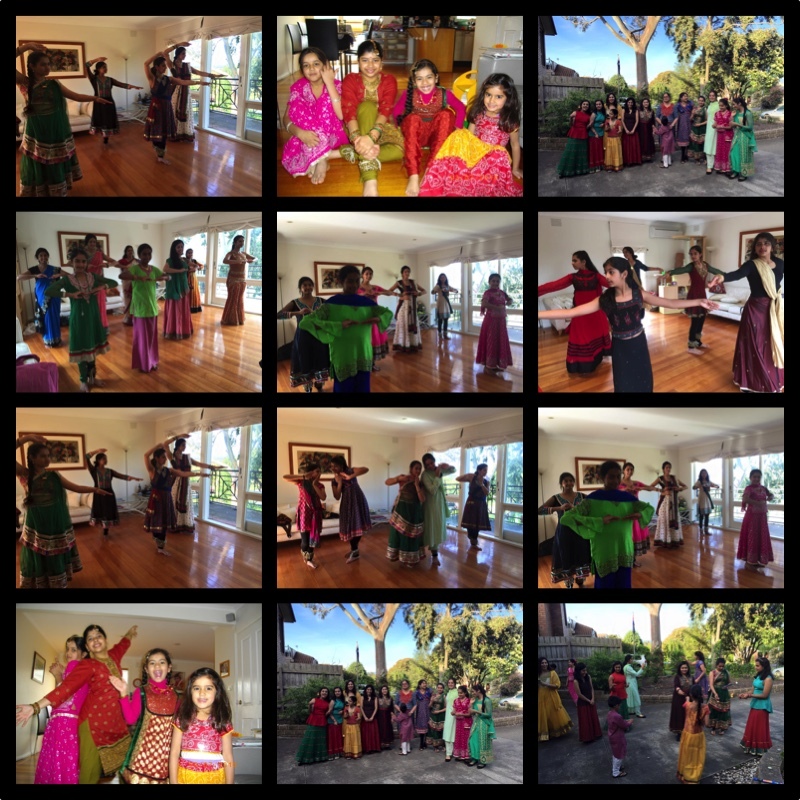 To make this possible, Ghungroo school of dance ensures several creative activities are explored during class sessions – by playing dress ups as Kathak dancers, compose their own “bols” (Kathak compositions) and choreograph dances. Today’s Kathak was very fun. I got all my dancing done. 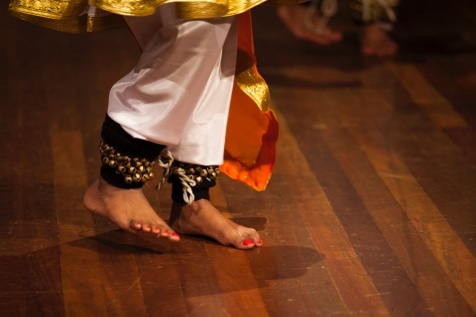 Today’s Kathak was a good lesson. Everyone danced well during the session. Today’s Kathak had kids but two of em. The kids feet were as stick as a stem. Today’s Kathak was a bit weird. I danced well and my teacher cheered. Today’s Kathak was very funny. After the class everyone’s face was sunny. Today’s Kathak was the best. We’ll have to wait till next class to find out the rest. 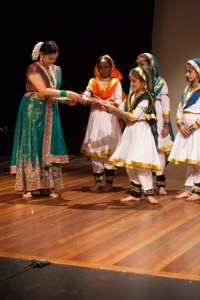 Ghungroo School of Dance follows the Prayag Sangeet Samity curriculum. At the end of each lesson students receive Practice Sheets containing written instructions for students to help them practice dance at home. Students are also taught to write down tukdas/bols and parhant (oral rendition of what they learn) with accompanying hand beats. For those initiated into the serious aspects of classical dance, Ghungroo gives the opportunity to students to participate in exams. Exams are held at the completion of each year. 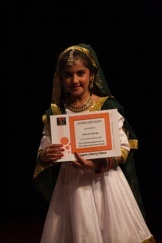 During every annual concert, Certificates are presented to participating students, on successful completion of examinations. Depending on the progress made by the individual, selected students are recommended for appearing in the Prayag Sangeet Samity exams, conducted by approved external examiners. The year 1926 is a memorable year in the cultural history of the Prayag Sangit Samiti, when it was founded. The Samiti is an Organisation registered under the Indian Societies Registration Act of 1860 and was founded with the sole aim of propagating and popularising the cause of Indian Classical Music in the country. Prayag Sangit Samiti is located in Uttar Pradesh, India. The founders of the Prayag Sangit Samiti had the vision and most sensitive social consciousness. It was their awareness as to the social aspects of music and the then prevailing low social status of music and musicians that made them determined to revolt against such social odds and evils and to reform and give an honourable status to music and musicians in the society. Since its very inception the Samiti has been striving hard for the propagation and elevation of the status of music, bringing about a new change in the activities relating to music and giving it an identity and feeling of self-realisation to musicians and students of music. The establishment of Prayag Sangit Samiti was a valiant attempt towards rescuing music from disrepute to which it had come during the period from 15th to 17th century. Moreover the trained musicians were till then the exclusive pre- princes, noblemen and big landlords the common man had no access. The vast change in the public attitude towards music and musicians which we witness these days, when musicians are honoured by Government and patrons of music, is in no way small attainment due to the untiring efforts of the Prayag Sangit Samiti. On a reviewing of and scanning the past stages of change in the History of Indian music, patrons of music, considering the dimensions and intensity of the change, will realize that prominently Prayag Sangit Samiti helped and struggled throughout its existence to bring about this renaissance. This was really a major change and there are very few parallels to it in the entire history of music. The growth and development of the Samiti in U. P. and other States of the country has been a continuous process, like other features of modern India, covering over 6 decades and should be treated in terms of its emergence under various stimulations. It was susceptible both to time and place. No objective lover of music will deny, that like in several other spheres, this development was a singular contribution of the organisers of Prayag Sangit Samiti Since its inception this premier institution has been rendering yeomen services to the noble Art of music. All through its span of over 60 years of existence, the Samiti has been playing the role of a torch bearer in the world of classical music and it can legitimately pride itself in having achieved high reputation for consistently upholding the highest and richest traditions of this sublime art. It can be rightly claimed that it has fulfilled its object in popularising the great art and raising its status throughout the length and breadth of the country. It was on account of intensive enthusiastic efforts of the Sangit Samiti that all old prejudices have died away and now every respectable house has developed a rare 1ove and attachment for music. The Samiti is housed in two imposing buildings of its own, one situated in the heart of the city of Allahabad, in India, in South Malaka and the other in the sylvan surroundings of the Alfyed Park, The Samiti has one of the biggest auditoriums in its new palatial building built at a cost of rupees seven lakhs. The Central Government and the general public contributed generously to the cost of the new building. It is no exaggeration to say that it has grandeur of its own.